Snow in Dixie Watch: Tuesday-Wednesday, Dec. 7-8? I’ve been keeping an eye on this for several days, but the models have been cagey about it, and I have been reluctant to make a blog post about it. For the past two years, predicting snow for central Mississippi in December has been, let’s just say, a fiasco, even for the National Weather Service office, and I’m not overly inclined to get burned a third time running. As a general rule, snow in the South tends to occur in late winter. That said, this is looking promising enough to warrant a blog post. It’s not a big system. In fact, it’s not easy to identify just what is going on with a surface chart, because the snow (if any) will be driven primarily by upper-atmospheric troughs that do not extend to the surface. What we have got here is a low pressure system off Atlantic Canada and a very strong jet streak that has dived as far south as the Gulf of Mexico. These two diagrams are by no means representative of every advection scenario that can occur. Thermal advection can happen at any level of the atmosphere. 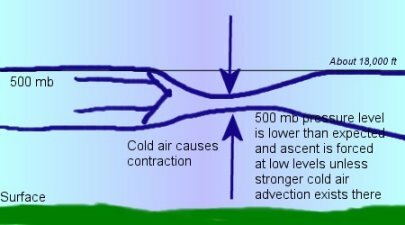 Whether the advection results in forced ascent from the surface or forced descent to the surface depends on exactly at what level of the atmosphere the strongest contraction/expansion is occurring and what is happening below and above it. We are going to be in a forced ascent situation, as shown in the second diagram. This results in pressure levels that are expected at a given altitude in the atmosphere (in this example, 18,000 feet) actually occurring at a lower altitude, thus the “trough.” But look: Relative to the lower levels of the atmosphere, there is a high. This is shown on the surface map. What’s important is that there will be forced ascent, not that there will be relatively high pressure at the surface. This feature is what is going to generate precipitation. 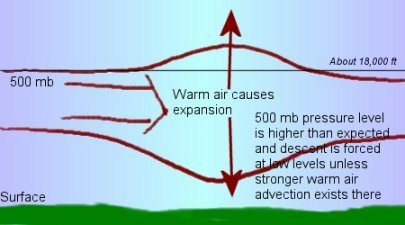 By creating a relative low aloft, it causes air at the surface to rise (nature abhors a vacuum), generating cloudiness. Precipitation is expected to fall as snow because there is no warm air getting between the surface and the layer of clouds, owing to that extremely southerly and extremely strong jet. Will there be snowfall? Probably. The big question seems to be whether any of it will stick. It has been cold enough lately to freeze the ground, but a big question mark is a layer of dry air at the middle to lower levels of the atmosphere. The forced uplift may take a while to fill this layer of air with moisture. We’ll have to see. In any case, keep an eye to the sky tomorrow night! 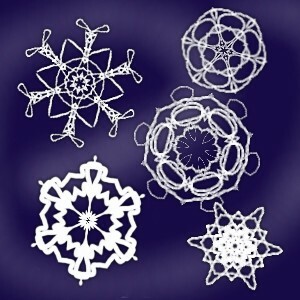 Comments Off on Snow in Dixie Watch: Tuesday-Wednesday, Dec. 7-8?